In this article are not only directions on how to get to Tagaytay's tourist spots, but a section for locating Tagaytay Hotels, as well. For budget travelers, cheap hotels in Tagaytay are almost everywhere there. Tagaytay is popular for the breathtaking views of the picturesque Taal Volcano which is visible from almost any vantage point in the city. But more attractions came out and this city in the highlands of Cavite instantaneously becomes a tourist magnet that attracts even the locals of northern part of Metro Manila. Thanks to The Sky Eye. Here's how to get to Tagaytay and the next ride to take in going to some of attractions there. Hotels in Tagaytay is our last subtopic. 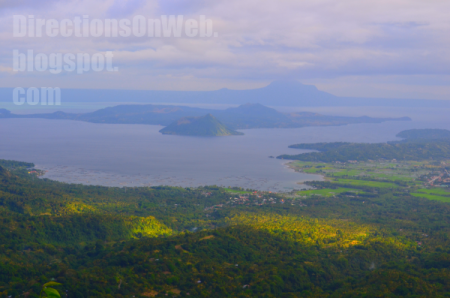 You can easily locate a hotel in Tagaytay using each provided Tagaytay map. So read the attractions' directions first. After that, the shortcuts to accommodations. The most convenient way to get to Tagaytay is via South West Integrated Terminal. If you don't know the location of Southwest Integrated Bus Terminal and how to get there, please go to Integrated Bus Terminal for Batangas & Cavite Buses. Take a bus with "Tagaytay" sign. You can also ride a "Mendez" or a "Nasugbu" signed bus. Your drop off point in Tagaytay City is Olivarez Terminal. Get off the bus there. Olivarez Terminal is located at the city proper of Tagaytay. It is the location of jeepneys headed to different spots of Tagaytay. Olivarez Terminal is located before the famous Tagaytay Rotonda. There are lots of commercial buildings, banks, retail shops, food stalls, fast foods and restaurants. How To get To Sky Ranch and Sky Eye? The sign of jeepney to ride in going to both Sky Ranch and Sky Eye is any of the following: Mahogany, Alfonso, Mendez, NBI. You don't need to go to the main terminal of these jeepneys as they stop and load passengers at the southbound lane of Emilio Aguinaldo highway, the lane where you alighted from the bus that you would have ridden from South West Integrated Terminal. But if you have decided to have some fast meal at any food establishments located at Olivarez Terminal, then you must cross Emilio Aguinaldo highway again to take one of these jeepneys. 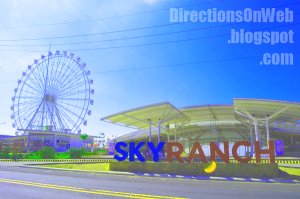 Sky Ranch and Sky Eye is located at the same location. To avoid confusion, Sky Eye is actually one of many attractions of or within Sky Ranch. There are just so much hypes about Sky Eye that make us think it is a separate destination. 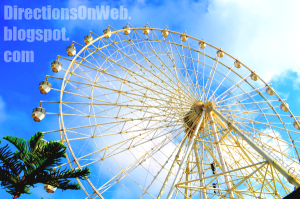 You can easily determine you are nearing the Sky Ranch because you will surely see the giant Ferris Wheel, the tallest in the Philippines, which is the Sky Eye itself even if the jeepney you're riding is still far. You will be dropped off at the side road opposite Sky Ranch giant marker. How To Get To Picnic Grove and Eco-Adventure Trail? 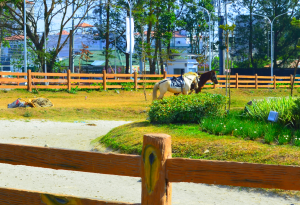 Picnic Grove and Eco-Adventure Trail are situated next to each other and perched in the sloping wide expanse of land and forest of Tagaytay mountainous land. How to go there? Head to Olivarez Jeepney Terminal and ride the jeepney bound for or with sign of "People's Park". There's a big signage of Picnic Grove at the right side of Tagaytay-Calamba Road where the Picnic Grove is located. Nevertheless, ask the driver to drop you off there. Once dropped off, walk your way up to the site of the Picnic Grove. 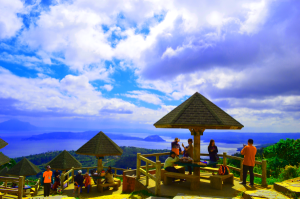 The recommended exploring of these two major destinations if I were to be asked is to first have an enjoyable picnic at one of the many huts of the Picnic Grove while enjoying the breathtaking view of Taal Volcano. Have some photo shoots. And after your stomach has digested all you have eaten, begin your adventure of Eco-Adventure Trail. You will definitely enjoy the trail as you walk and follow the directions of the interconnected wooden bridges as the trail snakes its way through the woods and ravines. Jump-off point of the boardwalk is just a few feet away from the Picnic Grove. The highlight of the trail is the hanging bridge which is a little bit heart pumping to cross. 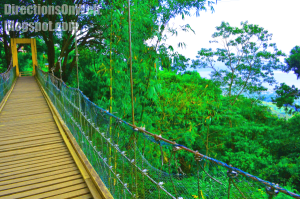 While crossing the hanging bridge, you can enjoy looking at the seemingly wild forest beneath it. Just don't panic as it is natural for a hanging bridge to be a bit wobbly. The view is really awesome for anyone who is nature's lover. 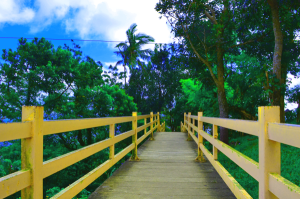 Past the hanging bridge, the boardwalk continued and you will be treated to different angles of Taal Lake views as well as the Taal Volcano that you can't make out at times but nevertheless gives a different feeling of disappearing panorama. As the trail climbs up in zigzag boardwalk, you will be passing by the launch pad of the zip line that you would have been seeing a long while. As you finished the trail, climb up the uphill opposite end of the Eco-Adventure Trail. Waiting for you above is the viewing deck which will give you great vantage points of the entire panorama of Taal Lake and the volcano. Other things to do in and around Picnic Grove are: horseback riding, cable car riding, boat riding, souvenirs shopping, etc. How To Get To People's Park in the Sky? 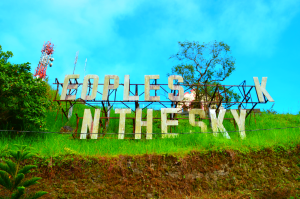 People's Park in the Sky is located at tip of a mountain where the route of the jeepney you will have ridden in going to Picnic Grove ends. Simply take "People's Park" signed jeepney at its terminal in Olivarez Terminal. The jeepney unloads the passengers just outside of the unfinished building intended to be a palace in the sky which is now known as "People's Park in the Sky." Magnificent view of the lowlands resplendent with verdancies and dotted with colorful villas. With the winding highway that looks like a car toy road curved in the mound and the tiny vehicles passing through it, the sight would pass for a grand miniature that you are looking down at. Getting inside the old unfinished structure, you get to see a cloistered garden where some travelers hangout and chat. 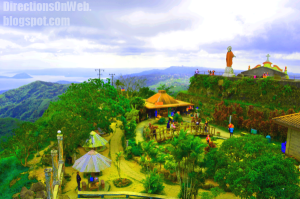 A mini chapel and a statue of Jesus Christ stand at the edge overlooking the zigzag road. There are souvenir shops, an eatery and a variety store. For call of nature, comfort rooms are located near the garden. The sign of jeepney to ride in going to the Puzzle Mansion from Olivarez Terminal is either "Nasugbu" or "Alfonso". Go to the terminal of jeepneys and ride a jeepney bound for Nasugbu or Alfonso". Ask driver to drop you off at "Radar Taas". Just say it "Radar Taas" in Tagalog. You can monitor the distance of the jeepneys as it approaches Radar Taas because there are signs of Puzzle Mansion placed conspicuously along Tagaytay Nasugbu Highway along which the jeepney route passes. In each Puzzle Mansion sign, the remaining distance is indicated. Do not panic when after a sign reads the lowest distance to Puzzle Mansion, the next sign would read increased distance. That's because the signs are for private motorists. 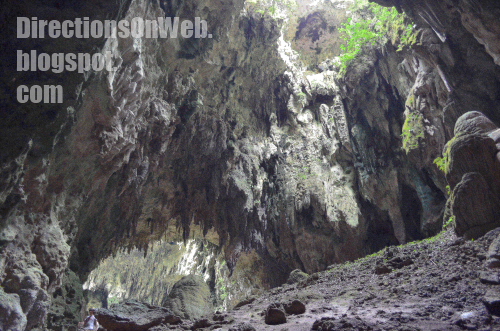 Besides, Puzzle Mansion is located at the very inner part of the village, Barangay Asisan. It is way too far from the highway. Once you got off the jeepney at Radar Taas, take a trike at their terminal that you would immediately see in the area. Your destination? 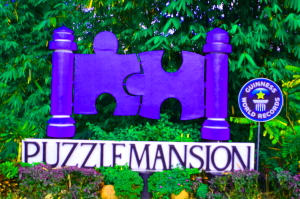 Of course, "Puzzle Mansion." Alternatively, you can wait for Puzzle Mansion free shuttle. It is not practical to go to Puzzle Mansion in public transportation. First off, there is no public transport ready anytime to take you back to the highway. You would walk uphill to get to a barangay road which seemed not served by trikes regularly. They said that there is a free shuttle that fetches visitors from highway to Puzzle Mansion and vice versa. But when I was there, I didn't see it. Maybe, they only use it during peak hours. If you don't want to be stuck for long hours in that spot, maybe you can pass visiting it. Puzzle Mansion is for kids as it is very educational. But if you are an adult, I'm afraid you would not appreciate it. The museum where the largest jigsaw puzzle collection is housed looked like an exhibit of large pictures and images in frames except they are actually jigsaw puzzles in photo frames. Each jigsaw is so neat that you would think that they've just been sliced but not actually undone to be fitted again. Like when you buy a small jigsaw puzzle and it's still in its plastic packaging and it is not yet opened. But the subjects of photography are great. You will see iconic and legendary figures such as The Mona Liza among others. There are also the scale models of New York, London, Chicago, etc. Php 100.00 entrance fee is expensive. They should charge Php 50.00 only. Why? 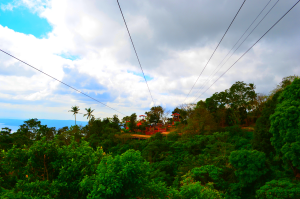 First, the going rate of entrance fees in major destinations of Tagaytay is only fifty pesos, including the Sky Ranch. Second, Puzzle Mansion is located in a far flung area that even driving a car to get there is arduous, a lot of bending narrow alleys going up and down, endless thoughts of you have already arrived in its location only to realize that you are still too far. Lastly, the very steep decent of the road that leads to its exact location. When I was there and about to pay, I overheard a head of the family asking "Pati driver my bayad?" in a somewhat disgruntled yet joking tone of voice. In taking a vacation to Tagaytay in budget, the key is to avoid online hotel bookings. Even if you type cheap hotels in tagaytay, search results will populate your browser with expensive hotels. Now if you have big amount of pocket money that you can afford Php 7k a day hotel, go book online. Tagaytay hotels are all-over. From as high as Php 8,000 to as low as 1,400. Now in the 3 maps below are hotels in Tagaytay. But the third one doesn't display a particular one because, in that area located are neighborhoods where 'homestays' signs are displayed outside houses sometime in a year. Now if it happened that a space is available when you get there, you are lucky because their cost is lower than the standard cheap hotels in Tagaytay. Problem is you will not see them all the time. The sign is removed once a place is taken. If that happens, the best part of Tagaytay is near the rotunda as it is nearer to terminals of jeepneys headed to different attractions in Tagaytay. Look at each map and see how numerous hotels are in Tagaytay. First map is populated by cheap standard hotels, second map displays first class hotels in Tagaytay, and the third map is where from time to time in a year homestay accommodations are available. In this first Tagaytay map are cheap hotels in Tagaytay. Our second Tagaytay map displays expensive Tagaytay hotels. In the third map is Emilio Aguinaldo Highway where homestays are available from time to time. The location is kilometers away before Tagaytay City proper and will be passed by bus from Manila so watch for that area when your nearing Tagaytay. hi, me and my friends are planning to go to Tagaytay but we wanted to go back in Manila same day..Is there's any buses whose operating 24 hrs back to Manila from Tagaytay??thanks! I will search for that and I will let you know as soon as I get the answer, thanks. hi! what signage we will took if we were going to starbucks tagaytay from olivarez terminal? Pls coordinate with jeepney driver there, thanks. hi! from manila to tagaytay? how much will it cost?? I mean How much is the cheapest budget if I want a over night? I am so sorry, I haven't updated the fare yet as of this moment. Thanks for the appreciation. With regards to hotel rates, I suggest we need to get to the areas first and check the actual price. nag iisip kasi kami ng girlfriend ko mamasyal sa Tagaytay, iniisip ko na this Oct 18 as a gift to her for our monthsary, baka pwede makahingi ng route or pagkakasunod sunod ng magandang puntahan. Hmm taga Cavite kami so medyo malapit lang hehe ..
You need to take it all in once there. Then you can decide according to time of the day as well as your mood. My suggestion is start off with Tagaytay Ranch and end your escapade in Picnic Groove which must be after you've seen People's Park. With other spots, put them in-between. Thank you so much for your very helpful & informative blog about Tagaytay's Tourist Spots. This time i have bright ideas about each of them. I already know where to go. Can you share how much can i spend on the bus from Manila to Olivarez Tagaytay? You are welcome. I'm sorry that I can't give you a figure right now as I am not updated with the current fare rates. Edi sa Coastal Mall po sasakay ng bus papuntang Tagaytay? No longer operational. Please read new post about new South West Terminal. Is there a place in Tagaytay where you can rent a scooter? Please inquire at the nearest tourist information desk there. This one is near your area, we also have Subic, Laguna, etc.